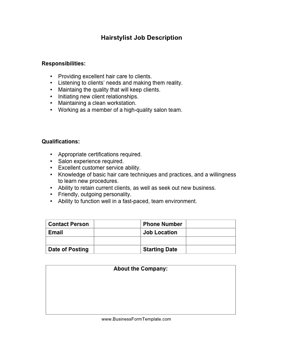 This hairstylist job description details the responsibilities and qualifications necessary for working in a hair salon. Providing excellent hair care to clients. Listening to clients' needs and making them reality. Maintaing the quality that will keep clients. Working as a member of a high-quality salon team. Knowledge of basic hair care techniques and practices, and a willingness to learn new procedures.